This is the repository for the SWITCHaai Root CA, which is mainly a collection of reference material about this certification authority. 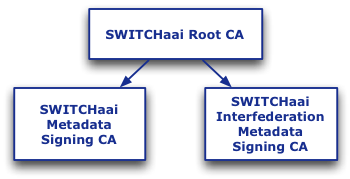 Note: Usually, the "SWITCHaai Root CA" certificate should be used to verify the metadata signatures. If a SAML implementation doesn't support this, the following certificates can be configured for metadata verification. In this case, deployers need to make sure to update the certificate when SWITCH starts using a new one (scheduled for Q2 2018).